Styrofoam balls in any size you prefer. I used 2 1/2 in. Feel free to buy bigger if you want. I think any size would look rad depending on the situation. 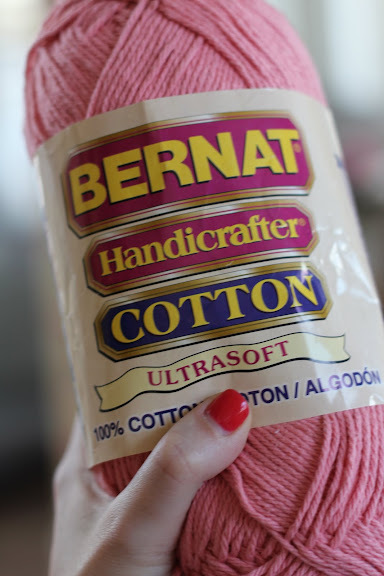 Yarn in the color you want. 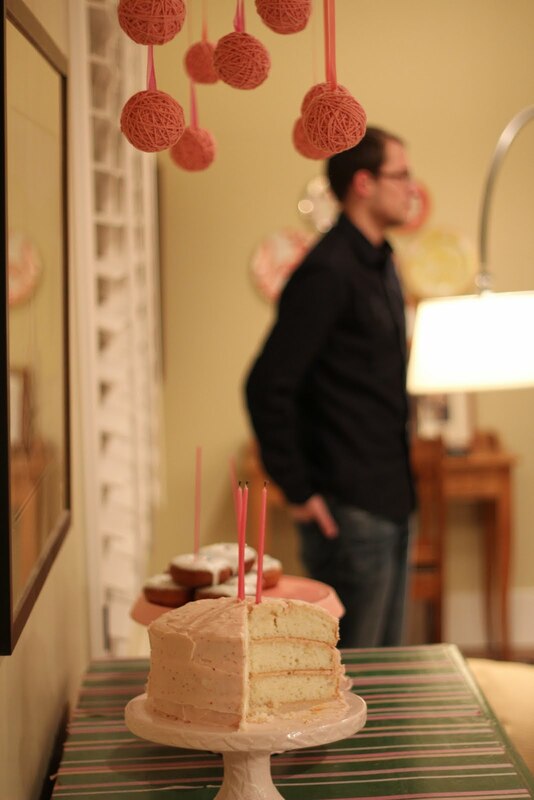 I chose pink because it was a "pink" party. The yarn I used is an inexpensive cotton yarn that on top of being inexpensive was 40% off. Sweet. 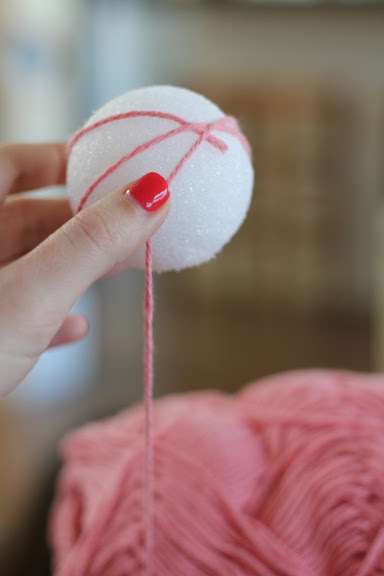 Find the end of your big skein of yarn and begin to wrap that end around your styrofoam ball (SHOCKER!). The styrofoam will "grab" the yarn, making this easy to get the wrapping started. Continue to wrap the yarn around the ball, snuggly. Make sure you evenly wrap for good coverage. Wrap until the styrofoam is sufficiently covered. Wa-la. Give your self about 6 to 8 inches of yarn, then cut it. 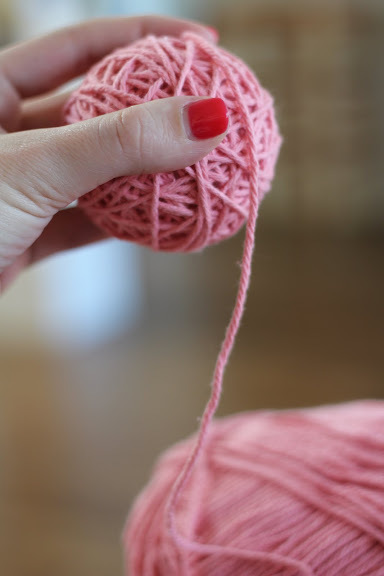 Take the excess yarn and wrap it around the ball and tuck yarn in and around the already wrapped yarn until it is secure and the end yarn isn't sticking out. Now we need to attach the ribbon for hanging! First off, determine where you are going to hang the balls and how much yarn you'll need to cut for each ball. Take your ribbon and pinch it together at the end. Making sure the ribbon stays folded (pinched), push a pin through the end of the folded ribbon down into the ball to secure. Push a second pin in for reinforcement. Folding the ribbon makes it look more finished and I like the tapering effect it creates. 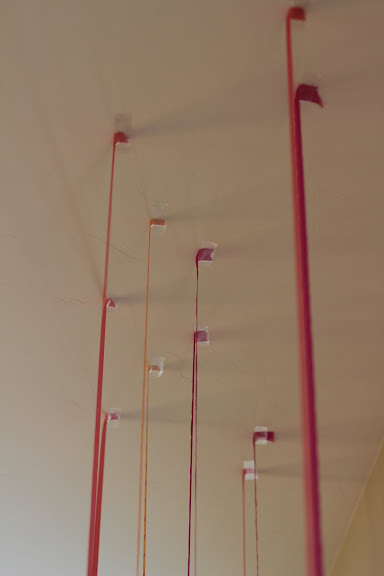 When you hang your yarn balls, start with the center point and work your way out. Don't take any measurements, just eye ball it and it will come out looking great. But don't be afraid to adjust things....the tape IS removable. 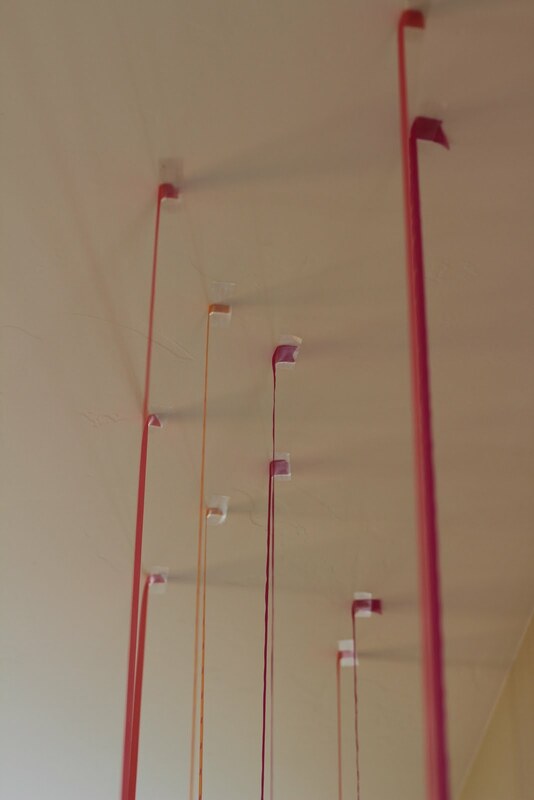 In my case, I hung them above a piece of furniture, so it was easy to use that for my spacing. it looks more streamlined and "finished". I also like that it appears as though the ribbon is growing from the ceiling. Happy Ball Wrapping! If you have any questions ask in the comments and I'll respond. I'll be back on Monday with the tutorial on the dot garland. Hope you all have a wonderful weekend! Thanks again for being here and reading our little slice of the internet. We love you guys! You have a gift. love it all. Awesome thanks! What exact color of yarn is that? Brit- Thanks, Steele. So do you!